Stay in the heart of the capital at Hotel Bristol Sarajevo, with an easy access to the financial district and the old town. Whether you're planning a business trip, family vacation or romantic weekend, you will enjoy the hotel's spacious, comfortable rooms. The hightech equipment of the meeting rooms are carefully designed to provide you with a memorable and joyful experience. Relax in the indoor pool of our fitness room or taste authentic traditional and international cuisine in our restaurant Brasserie. Sarajevo is the capital of Bosnia and Herzegovina. Country's administrative, economic, cultural, education and sport center. Coexistence in Sarajevo has led to a unique rich and enchanting mix of cultures attracting visitors from all corners of the globe. Spacious, contemporary in design, and adaptable, the Novotel room is truly a place for living, perfect for all your needs. Spacious and dressed in warm colors, overlooking Novo Sarajevo. Enjoy in this welcome escape after an eventful and lively day. Room is equipped with separate bath tub and shower, inroom safe, free WIFI. Try the famed European hospitality and feel our casual contemporary atmosphere at The Brasserie. We serve you international specialties with a modern interpretation, prepared from the finest seasonal organic products. Contemporary, yet relaxing design. The ideal setting for you to greet friends and business partners. A paradise of flavours, each inviting you to indulge to a full extent: the finest international pastries, cakes, and a wide selection of hot and cold beverages from all over the world. Until now I was always satisfied with all provided services, but last time not really. During morning there was no warm water in the room and when I informed the front office they just said, &quot;yes, we are aware of the issue, it will be solved within an hour&quot;. It was already at 7 in the morning, the guest with business reason were leaving the hotel that time already, there was no time to wait for the warm water. No further regret from people at the reception. During the breakfast the warm dishes were also cold. So this time I did not enjoy my staying there. really very good hotel modern, very tasty breakfast nice big and comfortable rooms, friendly and professional staff nice SPA with swimming pool and sauna. The food in restaurant as also very good. I can really recommend this hotel. My favourite hotel in Sarajevo. I asked in the front to place my le club number on my staying but seams to that they don’t makde it because it is not listed in my activity. High standard with great value for money. I visit Sarajevo frequently. My experience at the hotel was excellent and appreciated that I was able to park my rented car at the hotel free of charge for my stay. As Accor Club member I Will definitely choose this property to stay again if parking is offered for free again. Staff is super and customer friendly. Just one item could be improved and that is having firmer and larger pillows. 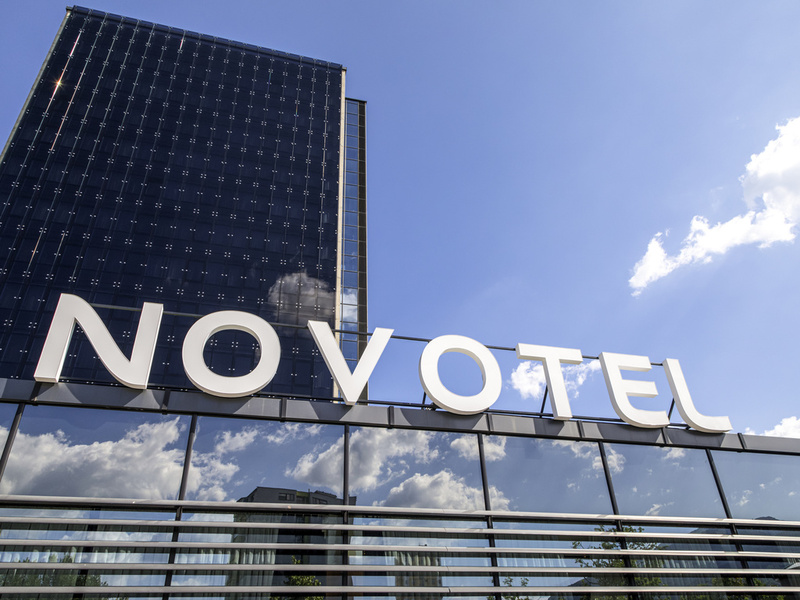 Overall a very satisfied customer experience and would recommend Bristol Novotel to all. This time I was very disappointed with staying ion your hotel. Price was higher than usually, rooms are extremely small. Table in room is so small that can not put a laptop into it. Everything else is perfect, other than the poor WiFi. Perfect room, great breakfast, superb attention from the staff. Lovely hotel for business and leasure trips. Very friendly staff, ready to help at any time, spacy and clean room, decent breakfast. Good location, not so far from the center and even to the airport. A very good Hotel to stay in.Rooms are comfortable breakfast is plentiful,gym/pool area well equiped.Hotel is handy to trams to and from old town.Staff friendly and helpful.Suggest a room desk light would help. Spacious, clean bright hotel. Bus from the airport stops close and there are also tram stops close by. Swimming pool, sauna and steam room are excellent. Breakfast was varied and very good. I ate at the hotel one evening and the food was good but I was surprised to find that no alcohol was available - I like to sample local beers when I go travelling so not being able to do this was a disappointment. First class customer service. Great location, staff and breakfast to start the day. During the second day at our stay at Sarajevo, our wallet had been stolen and all of us documents, cashes, and credit cards had gone away! Afterwards, the hotel was extremely kind to send us a car and a guy who was also helpful to lead us to the police station and did their best in helping us out. We would appreciate for everyone in the hotel especially the front team in the lobby. Without your senseless assistance and warm heart comforts, we cannot imagine how worse the situation was! We would definitely recommend Bristol and come back. Glad to have a 2nd opportunity to visit & explore Sarajevo - geographically & historically. Novotel staff once again very professional, polite & helpful. My thanks to them for room upgrade. Novotel location not ideal but public transport (trams) very convenient nearby; nonetheless, long-distance bus & railway stations, Avaz Twist Tower, Historical & National Museums, Tito's Café, Parliament, City Center shopping mall are all within reasonable walking distance - albeit without luggage & weather permitting! Shall probably return in 2019! I stayed at your hotel under the reservation number GDMLCBXD. During check out, front desk told me that I had to make a payment of 196.20 EUR although I showed them a confirmation email from Accor saying there is nothing to pay - it was all prepaid. They said they would talk to Accor and let me know the outcome. They didn't get back to me since but my card is charged by your hotel for 391.74KM. Can you explain what is happening? Secondly - in room 801 wardrobe, I left my brown sweater - Marks & Spencer brand. Did the cleaners find and return it management? How can you send it to me? Regards, Bahadir U.